Visions of Jesus Christ.com - Elisabeth Galgóczy - Stigmatist. Below text from book - Love knows no bounds. The Life of Elizabeth stigmatized Galgóczy. Rough translation from Hungarian. Brief Bio: Born June 27, 1905 a child of a family of 11 children. Only four children reached adulthood. Her parents were deeply religious people. At the age of two she has lost her father. She was always very sick little girl, barely able to graduate schools. First communion is only possible because of the fourth age of many absences. From then became a daily communicant. 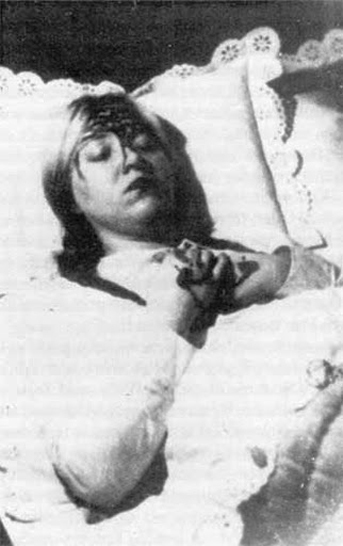 In 1919, after the end of World War I the Romanians were constantly raiding the city, Elisabeth provided the needed opportunity to emulate the martyrs after they had admired their exploits in religious instruction. The small castle church was heavily bombarded, the Holy of Holies had to be rescued. Elisabeth crept back, slipped through a hole, took the full dining chalices (ciborium) to after they had broken up the tabernacle, and swam with the sacred well by the river. No one had been privy to this plan, but now were all full of admiration for the little heroine. 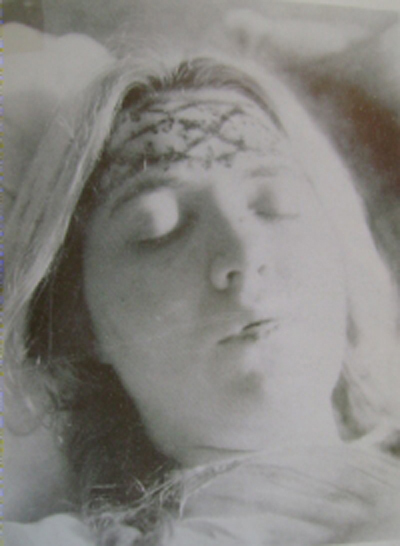 Elisabeth fell ill in 1920 from a severe pneumonia, which damaged her lungs almost entirely. She had to lie motionless in bed. Her then spiritual director, Dr. Johann Liebner, recognized the grace that was active in the young girl, and advised her, all her sufferings for the souls, especially for the students in the seminar, to sacrifice, to pray for them and to keep a diary. Since Elisabeth wanted to be healthy necessarily, she made ​​a plan to go to Lourdes. Then Mother of God appeared to her in a dream. Also she saw the crucified Saviour on the Cross and after she woke up, her hands and feet were bleeding. Due to the heavy burden of all their skin was wiped out. But it was not yet the stigmata. 1929 Elizabeth was visited by a very beautiful woman. Never before had she seen such a beautiful and loving lady. Every day was the visitor in the sick-room without being noticed by others. Each time the room smelled of roses when she was gone again. The beautiful woman used and taught the helpless sick people who had to live like in a prison. The training she received from the lady, was: "He who loves Jesus truly, always want what Jesus wants and what he loves. Who loves Jesus truly be sacrifices all the more gladly, the larger it is. " Who was this wonderful woman who had adopted her? Finally, Elizabeth was able to experience it too: She introduced herself as "Mariaschka," which is a diminutive of "Mary" in Hungarian. On the night of the Assumption she was allowed to accompany the visitor in the sky, where she saw all the saints of God and the mother with the child Jesus on her lap in a dream - it was Mariaschka! Elisabeth now handed over the baby Jesus those flowers that had brought her the Mother of God into the room before. Elizabeth writes about this in her diary: "When I gazing after, I nearly fainted with fear and fright: On my hands, on the palms and also outside, I saw fresh blood covered, burning, red sores. When I turned my hands, blood rushed out from the palms of them, and I felt this strong, burning pain, accompanied by a lively, pulsating feeling as if they were caused by a burning coal. "Elizabeth was shocked by her stigmata and wept. The Mother of God did not let a long time coming and comforted her little protegee with the words, the wounds may be a sign of the love of Jesus. Elizabeth was chosen to be educated to become a tool in the hands of God's Son. After Holy Communion from the hands of her spiritual director Elizabeth suddenly realized that the wounds were gone. She was destined to be allowed to receive the crown of thorns of the Lord. It happened on Christmas Eve, as the Mother of God came to Elizabeth, to bring them to Bethlehem. Everything was Elizabeth before as we know it so well from our Christmas stories. Only one thing was different: The Child Jesus wore a crown of thorns and cried. But Elizabeth offered himself as a sacrifice to liberate Jesus from his sufferings. As his mother Elisabeth put the crown of thorns on her head, and immediately felt the atonement soul excruciating pain while the baby Jesus began relieved to be smiling. When Elizabeth woke up, she saw her pillow full of blood and felt each touch of your head as if you would a nail driven into the brain. Elisabeth exhausted herself almost completely. In the shelter of her house she was without care and lonely in a corner with wounds that no one joined. She no longer thought of herself, but reached in those days of terror the peak of self-sacrifice: she prayed incessantly for the poor country, for the soldiers and their city and for the dead. She hugged each cross, which sent her to the Lord, and their prayers for friends and strangers were answered. In all the concerns of the soul and of the body of people came to Elizabeth until her death in 1962. The responsible Ordinariate in Hungary is committed to her beatification. - Elisabeth Galgóczy I have known. - In dealing with her I had not experienced the least trouble. On the day of her death, I stood with her. At her funeral I attended. - The deepest impression left me her embossed suffering life. It made all the supernatural impression. - Their sufferings she made a wonderful impression on all. The prayers answered by them are innumerable. - Their sufferings she wore result in God's Holy Will. - Since her death, I am in prayer often associated with it. - God help me that everything I talked about Elisabeth Galgóczy is the truth. - Koloman Doroszlai erzbischöf. Council, retired pastor Székesfehérvár, 11 April 1972. - I took her over to my house because they lost their loved ones. She was left completely alone. In Kisújszállás I had enough space to accommodate them there in the rectory. Since I could not convince me of their spiracles personally, I thought it my duty to grant her human protection.